Homeland of famous artists and talented scientists who changed the order of the world, home to the largest number of UNESCO World Heritage sites, and a kaleidoscope of enchanting scenery — Bella Italia! From all kinds of ancient monuments of Rome and the charming romantic Venice, to the rolling hills of Tuscany and cosmopolitan Milan, the country — a limitless source of attractions. Based on user ratings it has compiled a list of the 25 best sights of Italy. This collection will help all travelers who plan their route in the country, as there are assembled some really interesting and unique places, as well as useful tips on how to have a good time and get the most positive impressions. Welcome to Sicily where you will meet one of its most spectacular sights. 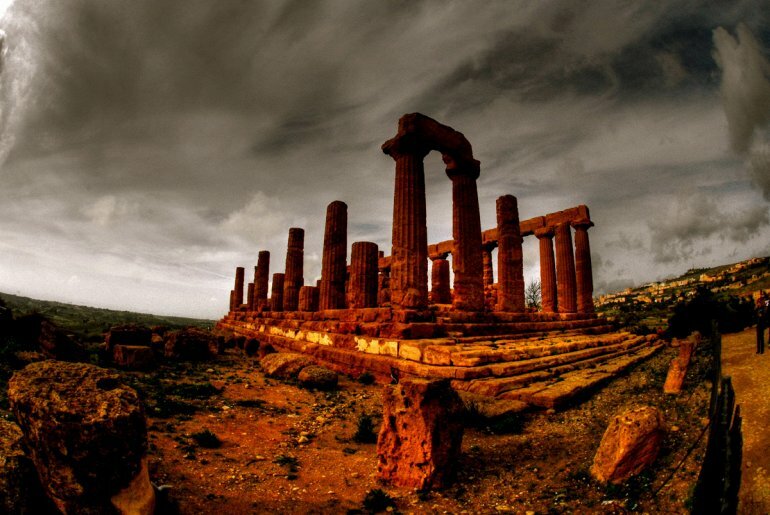 The Valle dei Templi is an archaeological site in Agrigento, Sicily, southern Italy. It is one of the most outstanding examples of Greater Greece art and architecture, and is one of the main attractions of Sicily as well as a national monument of Italy. The area was included in the UNESCO Heritage Site list in 1997. Much of the excavation and restoration of the temples was due to the efforts of archaeologist Domenico Antonio Lo Faso Pietrasanta (1783–1863), who was the Duke of Serradifalco from 1809 through 1812. The archaeological park and landscape of the Valley of the Temples is the largest archaeological site in the world with 1,300 hectares. The term «valley» is a misnomer, the site being located on a ridge outside the town of Agrigento. Due to its good state of preservation, the Temple of Concordia is ranked amongst the most notable edifices of the Greek civilization existing today. Notably the UNESCO symbol alludes to this temple 6 column facade. It has a peristatis of 6 x 13 columns built over a basement of 39.44 x 16.91 m; each Doric column has twenty grooves and a slight entasis, and is surmounted by an architrave with triglyphs and metopes; also perfectly preserved are the tympani. The cella, preceded by a pronaos, is accessed by a single step; also existing are the pylons with the stairs which allowed to reach the roof and, over the cella’s walls and in the blocks of the peristasis entablature, the holes for the wooden beam of the ceiling. The exterior and the interior of the temple were covered by polychrome stucco. The upper frame had gutters with lion-like protomes, while the roof was covered by marble tiles. A World Heritage Site and National Park, one of the cleanest and most flavorful regions of Italy and the jewel in the crown of Liguria — the famous 5 lands Italy, Cinque Terre. Five delightful colored urban nest on the steep cliffs of the Italian Riviera. On these places on the Best-Journal has written a number of very interesting articles, we strongly advise you to follow the link and review them. Over the centuries, people have carefully built terraces on the rugged, steep landscape right up to the cliffs that overlook the sea. Part of its charm is the lack of visible corporate development. Paths, trains and boats connect the villages, and cars cannot reach them from the outside. 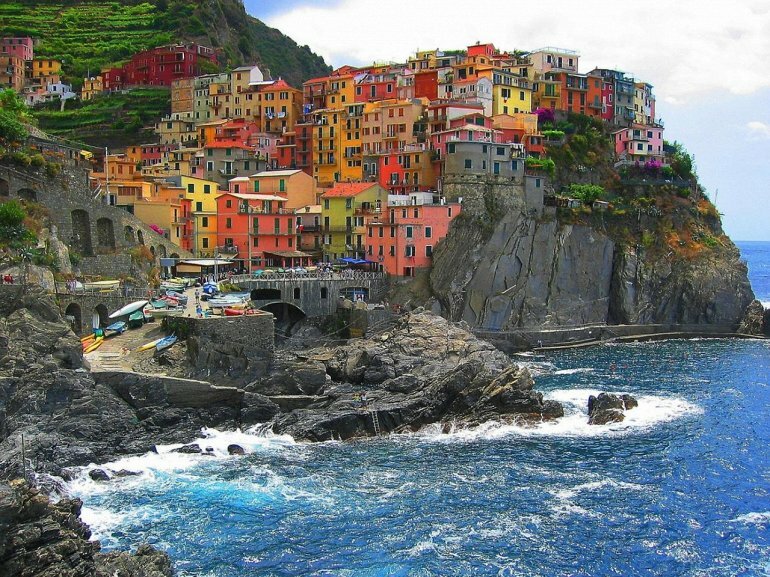 The Cinque Terre area is a very popular tourist destination. With a reputation as one of the finest museums in the world, the Uffizi Gallery keeps unique works by Giotto, Botticelli, Mantegna, Correggio, Leonardo da Vinci, Raphael, Michelangelo, Caravaggio, Dürer, Rembrandt and Rubens. More info about this, see the article about the sights of Florence. The Uffizi Gallery is a prominent art museum located adjacent to the Piazza della Signoria in central Florence, region of Tuscany, Italy. One of the most important Italian museums, it is also one of the largest and best known in the world, and holds a collection of priceless works, particularly from the period of the Italian Renaissance. 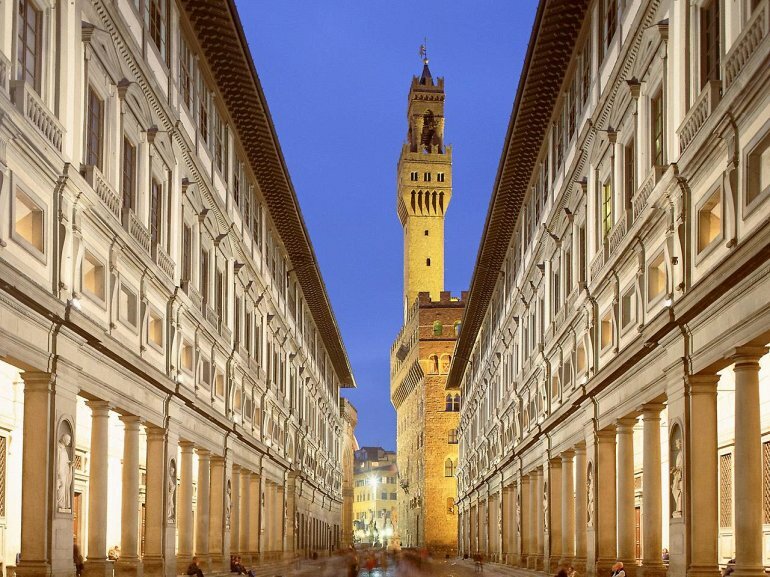 The building of Uffizi complex was begun by Giorgio Vasari in 1560 for Cosimo I de’ Medici so as to accommodate the offices of the Florentine magistrates, hence the name uffizi, «offices». The construction was later continued by Alfonso Parigi and Bernardo Buontalenti and completed in 1581. The cortile (internal courtyard) is so long and narrow, and open to the Arno at its far end through a Doric screen that articulates the space without blocking it, that architectural historians treat it as the first regularized streetscape of Europe. Vasari, a painter and architect as well, emphasised its perspective length by the matching facades’ continuous roof cornices, and unbroken cornices between storeys and the three continuous steps on which the palace-fronts stand. The niches in the piers that alternate with columns filled with sculptures of famous artists in the 19th century. 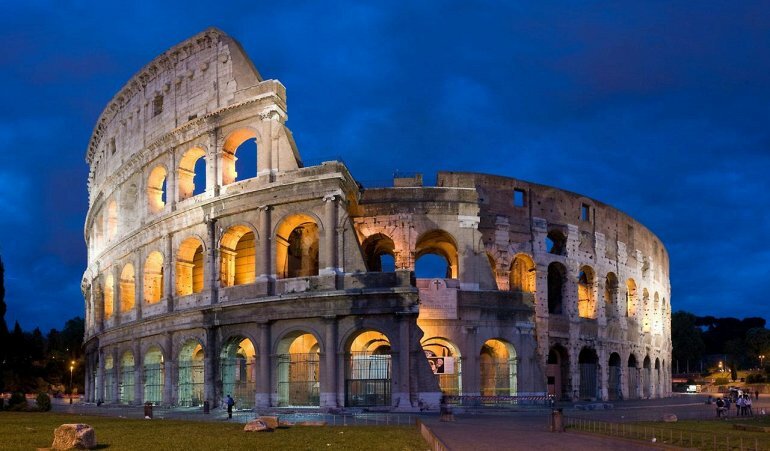 One of the most recognizable landmarks in Italy — the largest remnant of antiquity, a typical amphitheater, an engineering marvel, the embodiment of architectural excellence, continuous proof of grandeur and the cruelty of the Roman world — Colosseum has been duplicated countless times in different cities around the world, but he remains one of the best places to visit in Italy. The Colosseum or Coliseum, also known as the Flavian Amphitheatre, is an oval amphitheatre in the centre of the city of Rome, Italy. Built of concrete and sand, it is the largest amphitheatre ever built. The Colosseum is situated just east of the Roman Forum. Construction began under the emperor Vespasian in AD 72, and was completed in AD 80 under his successor and heir Titus. Further modifications were made during the reign of Domitian (81–96). These three emperors are known as the Flavian dynasty, and the amphitheatre was named in Latin for its association with their family name (Flavius). The cut in the rocks and baked Mediterranean sun, Sassi forms an urban complex of prehistoric habitation, which, in fact, is simple caves, one above the other. It’s a maze, consisting of a number of underground passages and caves, hiding the relics of the past. 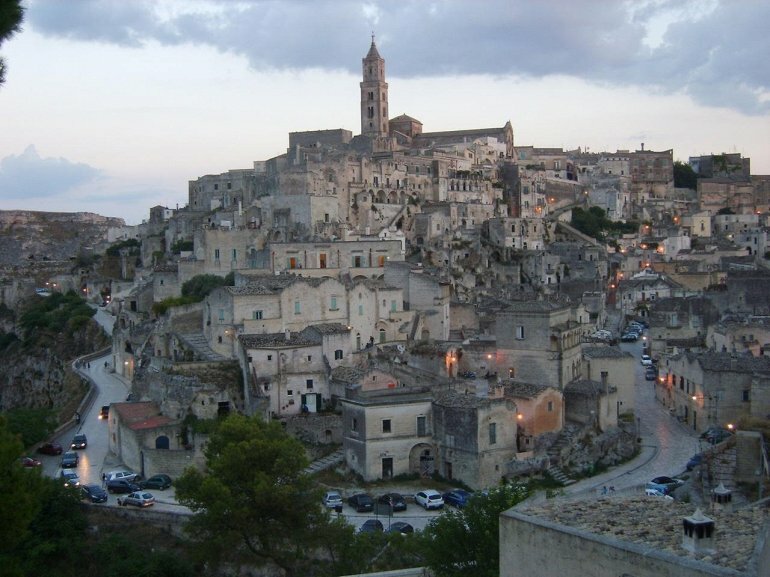 The Sassi di Matera («Stones of Matera» in English) are ancient cave dwellings in the Italian city of Matera, Basilicata. Situated in the old town, they are composed of the Sasso Caveoso and the later Sasso Barisano. The Sassi are houses dug into the calcarenitic rock itself, which is characteristic of Basilicata and Apulia, locally called «tufo» although it is not volcanic tuff or tufa. The streets in some parts of the Sassi often run on top of other houses. The ancient town grew up on one slope of the ravine created by a river that is now a small stream. The ravine is known locally as «la Gravina».